The history of organized education in Guelph extends back to soon after the founding of the City. In the summer of 1827, John Galt began constructing a schoolroom, a room attached to the Priory, Guelph's first permanent structure. The following year, a separate permanent stone school was built to serve as the schoolhouse. In 1841, the District councillors invited Arthur Cole Verner to become headmaster of the Wellington District Grammar School, marking the beginning of formal secondary education in Guelph. The first Board of Education proper met on May 11, 1842. The Board was chaired by Rev. Arthur Palmer with Rev. P. Wastel, Rev. Thomas Gibney, Rev. J. Smith, Dr. Henry Orton,, Thomas Sandilands, Charles Julius Mickle, William Neeve as members. A.A. Baker was the first clerk of the Board. The Board assumed control over all schools in the District and undertook inspections, repairs, staffing, and the establishment of new schools where necessary. On March 20, 1856, the first meeting of the United Board of Grammar and Common School Trustees was held and the City of Guelph Board of Education assumed responsibility for all schools in the City. In 1865, Henry W. Peterson drafted the first by-laws of rules and regulations for the Board. These served as the basis for all subsequent rules until into the 1960s. In 1880, when Guelph became a City, the system of election of school trustees was changed to provide for the election of two trustees per ward, six City Council appointees (later reduced to five), and one appointee from the Separate School Board to make 19 members in toto. The electorate approved a change in the system in January 1933 whereby a municipal board of nine members was to be elected by the city at large. The one appointee from the Separate School Board was retained. In 1960, by provincial statute, the number of elected members was reduced from nine to eight. From 1966 to 1968, the Boards of Education for the City of Guelph and Guelph Township joined and the amalgamated Board was renamed the Guelph District Board of Education. Further amalgamation was pursued and effective Jan. 1, 1969, the Board was officially named the Wellington County Board of Education. On January 1, 1998, in accordance with the Fewer School Boards Act, yet another amalgamation took place with the Wellington County Board of Education and the Dufferin Board of Education merging into one Board. The new board was officially named the Upper Grand District School Board. The Upper Grand District School Board comprises all schools in Wellington and Dufferin Counties. For a very short time during the pre amalgamation planning, the Ministry of Education named the two previous Boards District School Board 18. For a more detailed historical treatment of the City of Guelph Board of Education, see Shutt, Greta. High Schools of Guelph. Toronto: University of Toronto Press, 1961. These records were housed by the Upper Grand District School Board (a successor agency to the Wellington County School Board) and were transferred directly to the archives of the Guelph Public Library in December 2002. 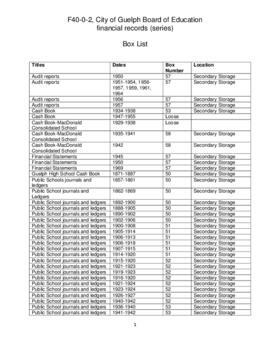 These records consist of school registers, Superintendents' and Directors' reports, annual reports, Board minutes, examinations, assorted financial records, training manuals, yearbooks, and an assortment of records relating to the history of the Board and its schools. These records only document schools in the City of Guelph proper. There are restrictions on access to some records in this fonds. See series descriptions for more details. For further details on accessing records in this fonds, consult the series descriptions.